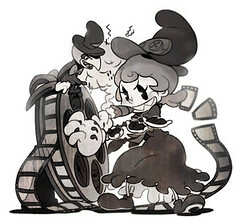 Starving for more Skullgirls video, you scoured the internet, foraging for whatever tidbits you could find. But it wasn’t enough. Rewatching old clips just weren’t doing it any more. Craven urges flooded your mind, tainting every thought. “No, no… that would be crazy…! But what if…? Oh yes, oh yes – that will work!” you think to yourself as you pocket your car keys and reach for your trusty axe. Look, none of that is necessary, OK? Seriously. We heard you, so we’ve cooked up another alliteration-heavy weekly feature: Friday Night Fights. Every Friday evening we’ll upload a new match video taken from the latest build to quiet the voices in your head and let you follow the game’s progress more closely than ever before! Other than that the game is looking very very impressive. a sketchy plan with an axe I was making sackgirl costumes of the characters (primarily Peacock at this time in LBP. Anyway that was a great clip. Thank you so much for this new segment! You truly know what the fans want! Btw, which one is Mike and which is Grinta? I like what you did with parasol turning back the wheel to the first version of the napalm tears and also giving her a type of wall bounce with her kick. Looks solid can’t wait to see the rest of the cast XD. Awesome! Game is looking so sharp so far, was hoping to hear Parasoul’s voice for the first time though but I can wait. Yeah, had to remove the old one and add ESRB stuff to it.